The project has already been co-financed in the form of grants, in two separate occasions, by the European Union through the Connecting Europe Facility for the execution of preliminary and final pre-works studies. An application to the EU for the co-financing of the construction of the project will be also be submitted. 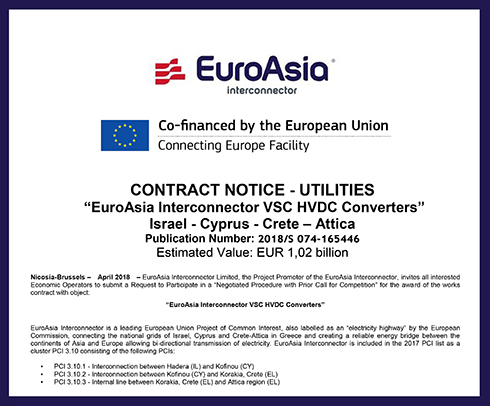 EuroAsia Interconnector is a multi-terminal VSC-HVDC scheme and will comprise four (4) converter stations with sea electrodes, interconnected by cables. The initial development will allow the transfer of minimum 1.000 MW between converter stations and the envisaged voltage level will be ±400 kV or more. This tender procedure concerns the first of the above-mentioned tender procedures and encompasses the design, manufacture, supply, installation and commissioning of the four (4) HVDC VSC Converters and the four (4) sea-electrodes including the MVDC submarine cables that will connect the land MVDC cables at the landing point with the sea electrodes. 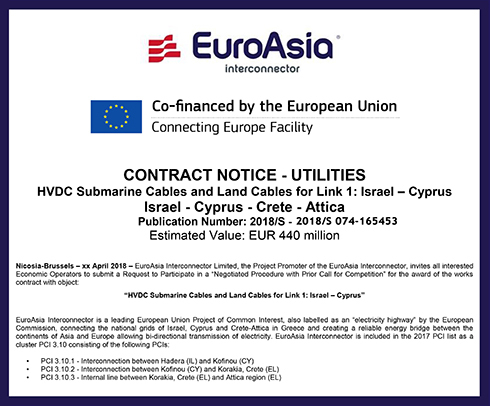 One Converter and its associated sea-electrode will be installed in each of the four locations, namely Israel, Cyprus, Crete and Attica. The deadline for the submission of Requests to Participate is 20 June 2018 at 11:00. 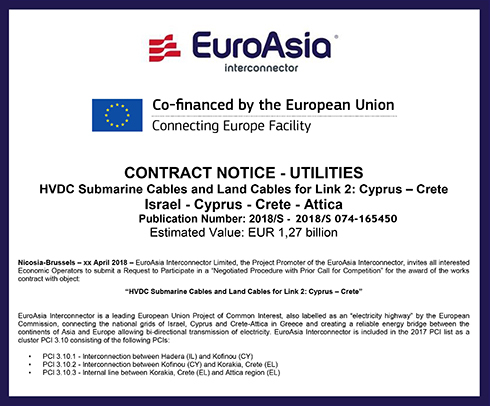 Next articleThe EuroAsia Interconnector project a bridge between Eastern Mediterranean and the European Union.